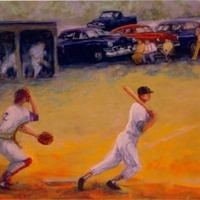 A painting by Bettye Reagan, a local artist in Central Florida, inspired by a photograph of men, possibly students, playing baseball in front of the Oviedo School, located at 601 King Street in Oviedo, Florida, in the 1940s. The school was first established in 1932 as a K-12 school. In 1948, the secondary grades separated from the elementary school. The upper grade levels formed Oviedo High School and moved to the campus at 601 King Street. Oviedo High School is notable for The Lion's Tale, the award-winning school newspaper recognized by various national and state scholastic press associations; its high ratings from the Governor's A+ Plan for Education; and its successful athletics programs. Original painting: Reagan, Bettye. Sunday Afternoon Baseball. 2001: Private Collection of Bettye Reagan. Digital reproduction of original painting: Reagan, Bettye. Sunday Afternoon Baseball. 2001. "Oviedo Baseball Game." RICHES of Central Florida. https://richesmi.cah.ucf.edu/omeka2/items/show/6946. Reagan, Bettye Jean Aulin. 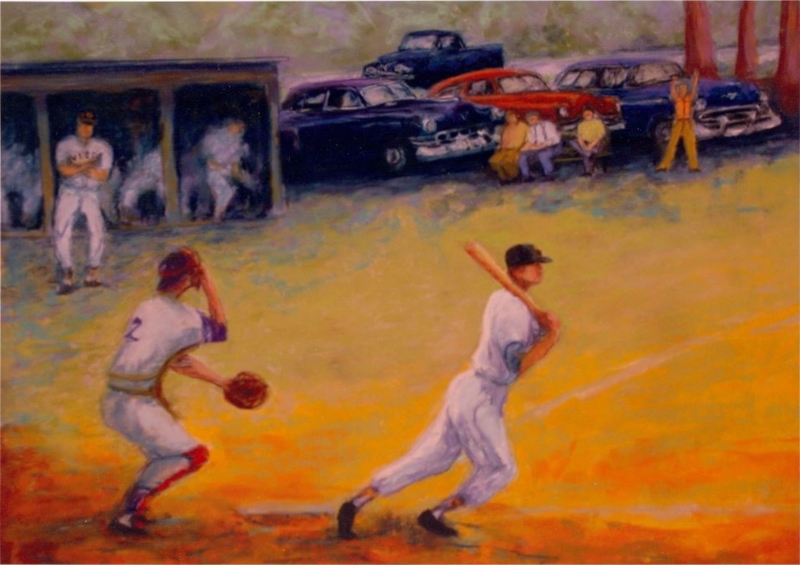 “Sunday Afternoon Baseball by Bettye Reagan.” RICHES of Central Florida accessed April 22, 2019, https://richesmi.cah.ucf.edu/omeka/items/show/6947.